If you love to visit Hawaii and hope to buy a home/condo here in the future, better make it soon. Coldwell Banker http://www.coldwellbanker.com/ just released a report that puts Hawaii’s housing costs the highest in the nation. An average 4 bedroom/2 bath home is more expensive than any other state, with an average listing price of $742,000. Kailua, on Oahu where Mike grew up (in a modest 3 bed/1bath home) and where President Obama and family plan to vacation this holiday season for the fifth straight year in a row, ranked 8th out ot the top 10 most expensive places to buy a home. We are so glad we bought our house when we did (2002), even though we tore it down and built what we now have. Because building materials have just spiraled upward also. Analysts say they expect prices to skyrocket even further in the future. I suppose the next thing they will rank is how Hawaii housing costs compare to the entire world. If your dream is to live in Hawaii, better buy while you can. I wish you the best of luck. Where Does Oprah Live on Maui? No matter what I post on any topic, it seems the thing people really most want to know is: where the heck does Oprah live on Maui? So, I will tell you. 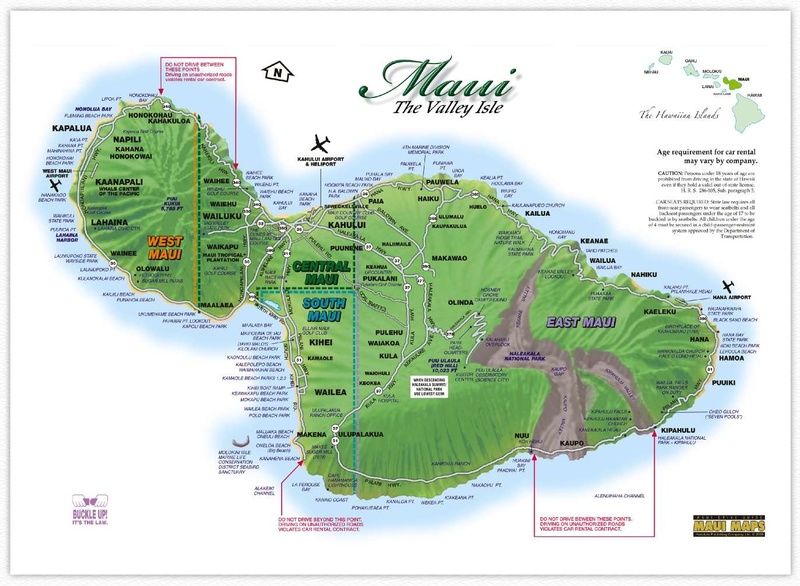 I directed tourists on how to get there all the time when I worked as a concierge at the Maui Kaanapali Villas: (www.astonmauikaanapalivillas.com.) Hard to believe, but it’s a destination drive for tourists now. I wonder if someday they’ll stop there with the tourist buses like they do on the Beverly Hills “See the Stars’ Homes” tours. And this is how we’ll get there: Let’s pretend you fly into Maui and board my Maui Magical Mystery Tours bus. We are now driving away from the airport, and the mountain range on your right is the West Maui mountains, and the mountain on your left is Haleakala. We’re going to go toward Haleakala. If you look at a map of Maui, and see Highway 37, we are going to follow that out toward Ulupalakua. When we get to the main intersection in Kahului (Dairy Road and Hana Highway, just past K-Mart) we make a left onto Hana Hwy. and stay on it about one mile till we see a big green sign on our right that says “Haleakala Crater” “Kula” and “Pukalani”. We will make a right. This is Hwy. 37. We will stay on this ALL the way until the turn-off for Oprah’s house. Since you’re not the one driving, you will get to enjoy the breathtaking scenery as we slowly climb the mountain. We will pass the turn-off for Makawao. While it’s a perfectly nice little cowboy town with a few art galleries thrown in, we won’t turn off. We will then pass the signs that say “Crater.” But we are on a mission, so we don’t turn off, as much as we might like to see Haleakala Crater. We will eventually pass mile marker 12, then mile marker 13. We will pass Rice Park on our left. We will keep going until we see mile marker 16.5 and Keokea Park will be on our left. Now, we SLOW DOWN. We will see a sign for “Thompson Ranch Road” because Oprah bought Thompson Ranch. Grandma’s Coffee House will be on our right, and we make the left onto Thompson Ranch Road, which immediately veers to the right. We are careful to make this right or we will be going uphill to Kula Hospital! We won’t know we are at Oprah’s house unless we are watching the hillside on the left. About a quarter mile down there it is, white and gleaming, perched on the hill. Lucky for us there happens to be a little turnaround were we can pull off on the right and view it. Would you like to get off the bus and stretch your legs? We’ve been on here for about 35 to 40 minutes now. Be sure to bring your camera…though you won’t get pictures anywhere is good as the one at the top. It’s uphill and the angle is not right for photos. Okay now, everybody happy? That’ll be $19.95 for the bus tour. Oh wait, this is Maui. Make that $89.95. Thank you for traveling today with Mauidailyescape.com. Remember, you read it here. Please tell your friends about this blog, and be sure to direct them to this post so they’ll know how to get to Miss Oprah’s house. Share it on Facebook…tweet it….then I can cover other interesting topics on this blog in the future. Thank you for riding along. A hui hou! (till next time.) If you’d like to subscribe to this blog, please click the Follow button on the Homepage. Mahalo for stopping by! http://www.youtube.com/watch?v=VYcBJnbpqo8. Dolphin Quest officials said that in the wild the survival rate of babies born to first-time mothers is about 50 percent. The new baby appears to be thriving. Dolphin Quest is holding a contest to name the little one, along with two others born recently, one to a 27-year- old named Pele and the other to a 28-year-old named Kona. Submissions for names should be Hawaiian words. The contest runs through Dec. 14th. Submissions can be made in person or online , and winners will get a swim for two with the dolphins and a photo CD. Sounds like a good excuse for a trip to the Big Island! Did you ever swim with the dolphins? What was is it like? Would you buy organic produce from Oprah Winfrey if you got the chance? It might soon be a reality here in the Islands. It appears she is turning her 160 acre property in Hana, Maui into a new business. The US patent office late last month received seven trademark filings under “Oprah’s Organics,” “Oprah’s Farm,” and “Oprah’s Harvest.” Earlier this year, several websites quoted a National Enquirer story in which Winfrey joked that she might move to Maui to run an organic farm if her Oprah Winfrey Network cable television channel didn’t work out. I feel it’s my civic duty here on Maui to report this to you, because “Where does Oprah live on Maui?” And “Oprah’s Farm” are two of the biggest search terms this blog receives. It would appear that even though Oprah has retired from network television, people still can’t get enough news of her. It will certainly be interesting to see what this organic produce from Oprah will cost here on Maui. Gerry Ross and Janet Simpson own Kupa’a Farms, an organic farm in Kula. http://kupaafarms.blogspot.com/. From their website it says that Kupa’a means firm or steadfast in Hawaiian and “describes the hard soil on our farm and our determination to amend and enrich it. The land was first cleared for corn and asparagus in 1979 and went organic in 2003.” I admire Gerry and Janet. Organic farming is not an easy life, unless you are someone who thinks that rising at 4 am is your idea of a good time. But then if we really believe that Oprah will be gettin’ up at 4 am to pick her own vegetables, then we probably also believe that the Easter Bunny fills in for Santa when he’s sick. For those of you considering moving to Maui, (and I hear from a lot of you!) here are the latest stats on real estate in the Upcountry Makawao/Pukalani area. The highest selling price was $1,780,000. The lowest selling price was $210,000. That was for a three bedroom/1 bath, 820 square-foot house on a lot size of 6595. This makes the median price $380,000. In Pukalani the highest selling price was $1,085,000. The lowest price was $220,000. That was for a three bedroom/1 bath 1486 square-foot house on a lot size of 11,221 feet. Be aware that these sales figures say nothing about the condition of the houses. There are some real stinkers out there. A house in Maui is in a perpetual state of returning to the jungle (rotting) from the humidity, red dirt, wind and rain. It takes a lot of time, love, and money to keep a house in tiptop shape. I couldn’t figure out why so many people let their houses go to pot, in need of paint, weeding and repair, until I owned a house in Maui and saw the kind of time and money it takes to keep one up. It’s like a continual battle between you and the jungle. Paint alone is much more expensive here than on the mainland. Don’t forget, they have to ship it.